This dish is designed for sharing as there's few things better than loading the table with a load of delicious food and some ice-cold beers and letting everyone get stuck in. Bavette comes from the flanks, meaning it’s been worked hard and so is packed with flavour. It needs to be cooked hard and fast, served rare and sliced thinly across the grain. Do this and you’ll have some seriously tasty, melt-in-the-mouth steak. If you prefer your steak more cooked, I’d opt for sirloin, which can handle longer cooking while staying tender. 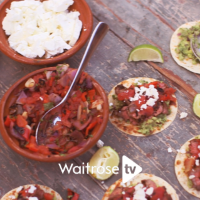 Track down the small corn tortillas from specialist Mexican food shops or online suppliers. 1. Trim the steaks of any excess sinew and put them into a large bowl. Mix together the chipotle paste, cumin, pepper and salt, then rub into the steaks, ensuring that they’re all evenly coated. Cover with clingfilm and chill in the fridge for an hour. 2. Remove the steaks from the fridge 30 minutes before cooking and preheat the barbecue for direct grilling. To make the guacamole, combine the onion, chillies, garlic and lime zest and juice in a large bowl. Halve the avocados, remove the stones and scoop the flesh straight into the bowl; by preparing everything in this order, the avocado comes into contact with the lime juice as quickly as possible, keeping the guac fresh and vibrant green. Roughly mash with a fork, stir in the coriander and season to taste. 3. Grill the steaks for 5–6 minutes or until cooked to your liking, turning regularly. Set aside to rest for 5 minutes then thinly slice. While the steaks are resting, wrap the tortillas in foil in parcels of four and lay on the grill to heat through. I wrap the tortillas in smaller parcels because it ensures that they heat evenly, and means you only have to unwrap one parcel at a time as you eat, keeping the others hot and fresh through the meal. 4. To serve, spoon a little guacamole onto a tortilla and top with a few slices of steak. Top with more guacamole, some salsa and crumbled feta. VARIATION: For a veggie version, swap the steaks for four large portobello mushrooms and marinate and cook as above; just wrap the mushrooms in foil once they come off the grill to keep them moist. This recipe was first published in Thu Jul 14 11:39:25 BST 2016.